The American Academy of Pediatrics issued a strongly worded statement in November 2018, that parents should not spank their children, and that corporal punishment at home had very harmful effects. The group comprised of 67,000 pediatricians. They defined spanking as ‘noninjurious, openhanded hitting with the intention of modifying child behaviour’. The policy was published in the December issue of the journal Pediatrics. The new policy is a shift from the earlier stand that merely ‘encouraged’ parents not to spank. However, now the policy is very clear. Parents SHOULD NOT spank their kids. Dr. Robert D. Sege, a pediatrician based in Boston, who is one of the authors of the statement pointed out that in parent -child relationship, our goal should be to ‘eliminate or limit fear and violence’. The strong stand against spanking is the result of multiple studies which began to be analyzed in 2016. To begin with, the research revealed that children do not benefit from spanking. Perhaps the only benefit is that the parent gets the child’s attention. It definitely does not teach right from wrong. Moreover, research revealed that corporal punishment was associated with increased aggression and defiance, and had outcomes similar to children who went through physical abuse. There is more bad news. Scientists who led a 2009 study of 23 young adults, who had repeatedly suffered harsh corporal punishment, found reduced gray matter volume in the area of their prefrontal cortex that plays an important role in social cognition. Furthermore, those exposed to hard punishment had a lower performance I.Q than that of the control group. 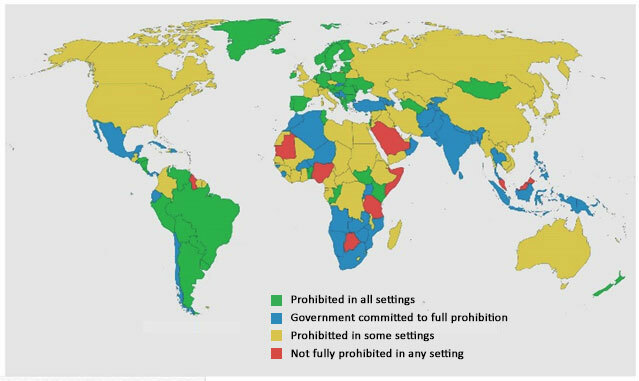 As of now, there are several countries that have outlawed spanking outright. Sweden became the first country to fully ban corporal punishment in 1979. The following map shows the countries that have followed suit as of 2018. Globally, sixty countries, states and territories have fully prohibited using corporal punishment against children at home, according to UNICEF and the Global Initiative to End All Corporal Punishment of Children. Surprisingly, there are still prominent European countries where it is legal to smack your child: Italy, Switzerland, the Czech Republic and the UK. But the writing on the wall is very clear. Barring very traditional and orthodox communities in some developing countries, the whole world is moving towards a ban on corporal punishment. It will happen sooner or later. If not by spanking, how do you discipline kids? Let us look at three of the most effective alternatives to spanking. This is one of the most effective discipline strategies with any age group of children. A teenager who refuses to clean her room does not get to use the house Wi-Fi for a day. A toddler who does not want to pack away his toys is not allowed any screen time for a day. The privilege taken away can be anything that means a lot to the child. But make sure this taking away is short-lived. Once the desired behavior is achieved, it should be given back. Time-out is a very popular form of disciplining children especially in western countries. This involves temporarily separating the child from the environment or activity that has given rise to the discipline problem in the first place. The goal is to punish the child for misbehaving in mild way by taking away the privileged environment, activity or things that he or she was engaged in. Time-outs may be in another room, on a chair, step, corner, or any other location where there are no distractions and there is reduced access to fun items, activities and people. A third effective way of disciplining is to make the child aware of the consequences if he/she did not do something desirable, beforehand. This means that the child knows the consequences of not doing something that should be done, and the parent lets the child go through the consequences. For example, when a child is assigned homework, he or she should be told of what consequences he/she would face if it is not handed in on time. In case he does not hand in the homework, the punishment agreed upon should be carried out, be it detention or time out. No amount of temper tantrums should persuade a parent to go back on a punishment agreed upon. This way, children know that all their actions have consequences, and negative actions have negative consequences.